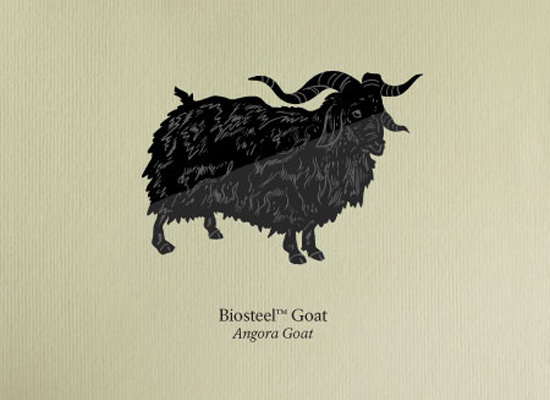 A former pick, and a favorite, is the BioSteel™ Goat, a breed of Angora goat whose genes have been augmented by the Nexia Corporation to produce spider silk in its milk — that is, its milk contains spider silk protein. This “silk milk” is purified, dried and then transformed into microfibers for use in making bullet-proof vests. Could they now be happily grazing on some pastoral meadow (sun-dappled but under a total genomic eclipse), mating with nearby flocks and still more further afield unbeknownst to their owners? Perhaps one should try to track them down, even procure the help of Trevor Paglen to map these biogeographical black spots.